Quick and Easy - Rollup Displays! 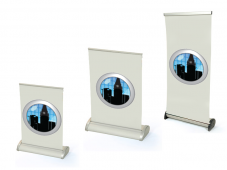 Heavy Duty - Retractable Displays! Instant Photo Booth or Press Conference! 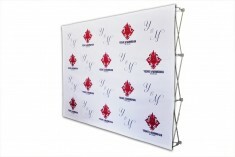 Eye Catching flags for your event or business! Trade shows have massive floor space. You want to have professional and attractive signage that draws eyes from the other side of the room, and also compels visitors to stop in instead of walking by. 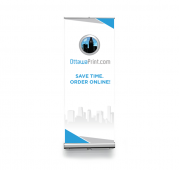 At Ottawa Printing, we offer banners, retractable banner displays, instant backdrops and fabric popup displays. 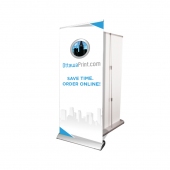 You can design these banners to perfectly reflect your branding. They are easy to transport and can be set up and taken down in a flash. Once your signs attract willing eyes, you want to keep them interested with materials that explain your products and services. At Ottawa Printing, we can help you with everything from brochures and flyers to catalogs and booklets to communicate your products and services. Trade shows should be used as an opportunity to schmooze and interact with customers in person, face-to-face. Successful trade show booths have some kind of interactive element or demo. Involve your audience and give them a break from the usual robotic sales pitches. Some companies work well with the basic face-to-face elements, but if used wisely technology can really provide a boost to your trade show booth. If you offer a service that can’t really be demonstrated in a trade show environment, have an HDTV which shows video of what your company does. Have a tablet for mobile sign-ups, or use interactive touch screens to connect with visitors. THANK YOU – THANK YOU – THANK YOU!!!!!!!!! It looks AMAZING – we are so impressed with such a tight turn over you were able to make it happen! We will not hesitate to recommend Ottawa Print to all of our clients! I just received the business cards and they look very nice (exactly as I expected them to be). Much appreciation for your time and service. I received the new cards today and I'm happy to say they're great! I'll be sure to use your services again and recommend you to others. We received our banner and it looks FANTASTIC!!!! Thank you so much for a great product and a super speedy delivery!!! You guys did an amazing job, thank you! The business cards are very nice! I am pleased with the out come yet again.. Prompt and fast delivery! I just wanted to say thanks to the team for doing such a great job on the backdrop! I received the banner yesterday. It looks great and was very fast in terms of turnaround time. Thanks so much! The business cards were received on time and in the expected state, thank you very much. I will be happy to use Ottawaprint in the future. I got my business cards and they look great! So thank you for all your hard work. Wow that was fast! It is perfect. Thank you for the Banner print. The process was easy and the outcome was amazing and right on time. Thank you to the Ottawa Print team for your prompt service. I have our order now. The business cards look great. I would like to thank you for the great product quality of the invitation card I ordered through you. Hello, I just received the delivery. Thank you so much it looks absolutely terrific! Thank you so much for your services OttawaPrint.com, for our agency! It is so handy to have a local company that can create our business cards and printed needs so well and in a timely manner. We love the online ordering system that makes it so simple. Wow, this is amazing how fast you were able to get these cards printed and shipped to us. Thanks so much. I love the banner so much! The flyers look great! Thank you very much for the business we will keep you in mind again! Tim and Team. I received my business cards today. Great package, great production! I am really pleased with the work. We received our banners today, just wanted to thank you, they look AMAZING!!! company. Thank you for taking your time to deliver the banners. Thank you! You guys are always quick, friendly and on time! Pleasure doing business. Got the brochures on Tuesday! Thanks a lot to all of you! You guys are great, thanks ! Thank you so much once again! The sign is perfect!! I just wanted to take a moment to thank you. The cards just arrived, and they look great! We received the business cards and they all look great! Just got the plastic gift cards in the last hour and they look great! I just wanted to let you know that we've received the banner and we are very happy with the result. Thank you very much! Thanks, I got the business cards! They look amazing. What’s the difference between one on-line printer with the same low priced business card promotion and who really gets the job done for you as they say they will - - - from all the others? …Ottawa Print actually gets the job done. Thanks Ottawa Print for coming through for me so quickly and producing my new cards fast, and delivered to my door within 3 business days - Job Well Done! Appreciated! I received the door hangers. They're great -- thank you. I received the cards, perfect as usual. I just received my very first order that I placed with you, and wanted to let you know that I am extremely happy with the final product. Being a graphic designer, I have worked with many local printers, and I tend to be very picky, but your service is perfect. It is trimmed properly, the colours look great, and the spot varnish is very precise. On top of that it arrived at my door a day earlier than estimated! I was a little hesitant to place the order at first because I could not believe that I can get 18pt thick cards with a matte lamination at such a competitive price, but I'm so happy with the purchase that my next printing job is already in the works. I will definitely be recommending your services to all my clients. Thank you very much for a great customer experience. The brochures arrived this morning, and they look wonderful. I'm very happy with the paper and print quality. Thanks for your help! 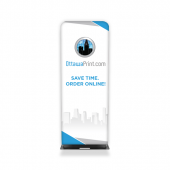 We've had many, many compliments about our retractable banners. Thank you! Received my business cards today. They look great! Just received my banner and it is wonderful. Thank you and look forward to doing business again soon. Thanks very much, we just received the order and the business cards look very professional, and my bosses are happy with the result. Amazing, thanks! I got the other business cards in today as well. I just received the delivery of the adhesive banner. Thanks very much!